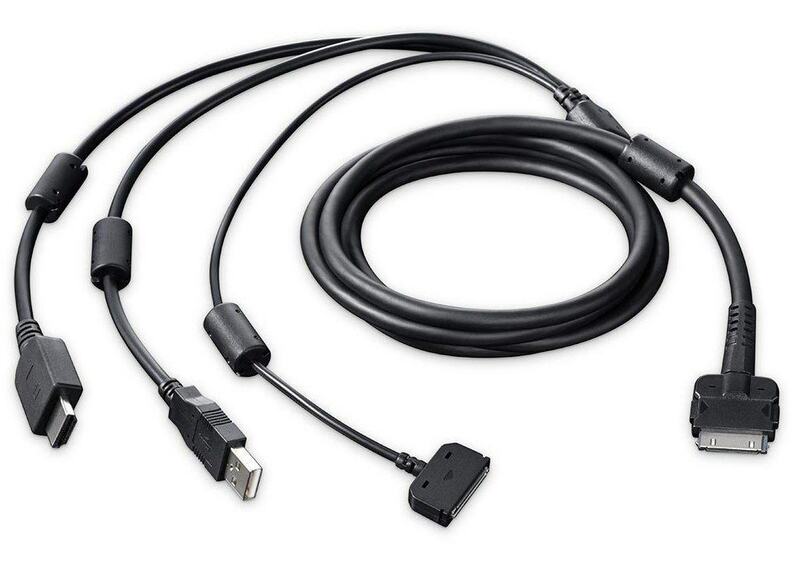 You can connect XP-PEN Artist22E to almost any computer, either directly or using an adapter. As it supports HDMI, VGA or DVI. The stand is the same you see with most pen displays these days. The one that make you rotate it from 15° to 85°. It also supports VESA mount in case you wanted to mount it to an arm, which will give you much more ability to move it around as you change the way you sit (or even to draw as you stand up, if the arm is long enough). It would have been nice if XP-PEN Artist22E came with a 3-in-1 cable, but you can use your own cables that way. In both cases you want to use longer cables, or in case one of the cables got damaged. The price is affordable for a pen display of this size, and that amount of hot keys. The cables are located on the side of it, which makes it easy to tilt it all the way. The pen & nibs replacements are cheaper to replace in case you had to. You may not like the screen protector if you didn’t attach it properly (I assume your unit came with the screen protector separately, otherwise, this is not an issue). In some XP-PEN Artist22E units, the hot keys may not work, or some of them at least. In that case, it’s better to contact XP-Pen’s customer support. The hot keys on both sides makes XP-PEN Artist22E suitable for both right-handed & left-handed people. Comes with the standard stand you see in Wacom Cintiq alternatives, which allows you to tilt XP-PEN Artist22E from 15° to 85°. Report Rate:- 220 RPS (Reports per second). 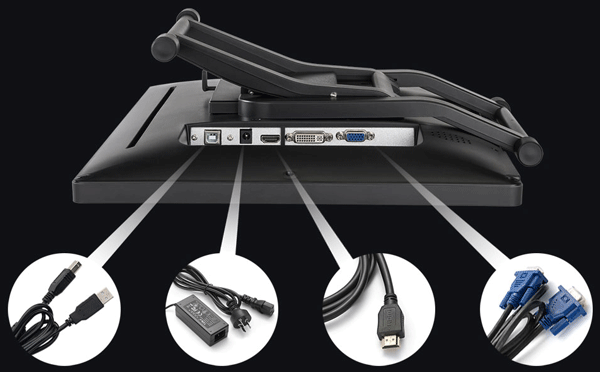 Supported ports:- VGA, DVI & HDMI. Cables placement is in the side, which means the cables won’t get squashed when you tilt XP-PEN Artist22E in a certain way. Windows Compatibility:- Compatible with Windows Vista, Windows 7, Windows 8, Windows 8.1 & Windows 10. Mac support:- Compatible with Mac OS / Mac OS X 10.8 or above. Compatible with many digital art software, like Adobe Photoshop, Corel painter, Manga Studio, Paint tool SAI, and more. 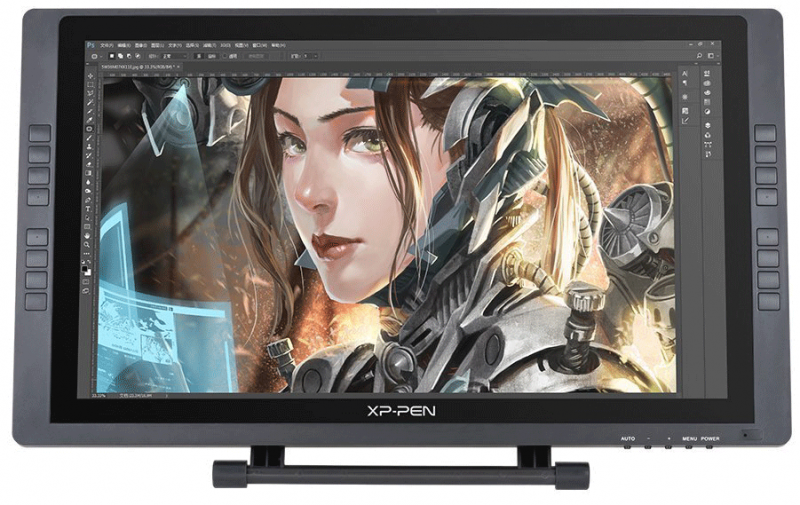 XP-PEN Artist22E has a 21.5 inch, which gives you a lot of drawing area to draw to your heart content. Whether you draw with your wrist or with your arm, this drawing area is more than enough for you for the most part. Unless you used a larger pen display before (and actually took advantage of it), you can’t go wrong with that size. In the case you don’t need a screen of that size, you will mostly end up drawing in the middle of the screen & won’t use the whole screen size, but in that case, the larger screen size won’t affect your drawing. The screen resolution is 1920X1080, or 1080P. While many of Wacom’s latest offering supports 4K resolution, this resolution is good for drawing too. Out of the box, you may want to calibrate & adjust the colors to make it look better. In case you care about getting the most accurate colors possible, then using another screen to check the colors is one good choice too. 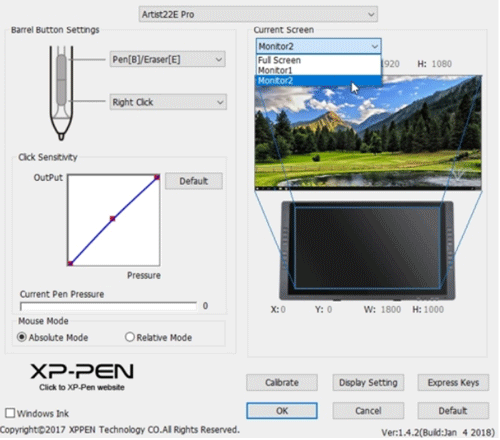 XP-PEN Artist22E supports 3 display ports, VGA, DVI & HDMI, this makes it compatible with almost any computer out there. As HDMI can be converted to Displayport & mini-Displayport. The display ports are located on the side of XP-PEN Artist22E, which makes it easy to tilt it without having to worry about the cables getting in the way. Some of the newer pen displays come with a 3-in-1 cable (like the one in the picture above, which is for another pen display), which helps with cable clutter. I like cables like that. While it would have been nice if XP-PEN Artist22E came with one too, having to connect each cable separately means you can replace any cable that gets damaged, you also have the choice of getting longer cables if you ever needed to. Let’s talk about drawing with XP-PEN Artist22E, first of all, it supports 2048 levels of pressure sensitivity. 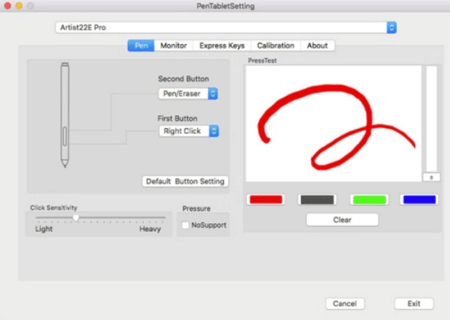 This feature allows you to vary the brush size based on how much you press the pen with your tablet. You can also vary opacity as well using pressure. Bear in mind your drawing application needs to support pressure for that to work (most drawing software support it). 2048 pressure levels is more than enough for drawing. Most newer drawing tablets & pen displays support 8192 levels, but I wouldn’t count this as a bad thing, as pressure sensitivity doesn’t determine if XP-PEN Artist22E is a good drawing device or not, and you aren’t likely going to benefit from it. In other words, there’s a diminishing return when it comes to pressure, so beyond a certain amount of pressure, you won’t need much more of it. A drawing device with less pressure sensitivity can be much better, if it was better in other aspects, like drawing area & parallax (more on that later). XP-PEN Artist22E’s driver gives you the option to adjust a pressure curve, which determines how pressure affects the brush size. For example, you can make pressure affects brush size less when you press too little, but much more when you press too little. You can even do it the other way around too. Some artists prefer strokes to come with very little pressure, while some other want it to come mostly when you press a bit too hard. XP-PEN Artist22E doesn’t support tilt sensitivity, which is similar to pressure, as it allows you to tilt the brush you’re drawing with. Most Wacom competitors don’t support that feature. This is a less important than pressure sensitivity. If you’re new to digital art, you won’t really need that feature, but it’s nice to try it when you get the chance to. There’s a screen protector that comes attached on XP-PEN Artist22E. The screen makes the screen matte, which makes the screen less reflective when light shines on it. At the same time, it adds friction with the pen, which makes it easier to draw lines, but you may prefer to draw on a more slippery surface (artists have different opinion on that). If you came from traditional drawing media like pencils, you are likely going to like the friction, it could make it easier to get into digital art. However, you may not like the glare caused by it. In case you didn’t like the protector, you have the option to remove it if you like. In the early versions of XP-PEN Artist22E, you get the screen protector separately, and you have the option to attach it on your own. Failing to do so properly may cause some rainbow effect, which can be quite annoying. It’s also worth noting that XP-PEN Artist22E’s screen looks much nicer when you don’t have the screen protector on. Parallax is one of the worse issues you should be prepared for when you get a pen display. And in the case of XP-PEN Artist22E, the situation is not really different. Parallax definition:- Parallax is an offset between the pen tip & the cursor where you draw your strokes. It often occurs when the pen display glass is thick (the thicker it is, the worse it can become). Parallax can appear more around the screen corners. While it’s possible to draw while having parallax, the more the parallax you have, the less natural drawing will feel like. Calibration is advisable when you tilt the screen or change your sitting position. Calibrating the screen can make parallax more bearable, but there’s still a chance you will have parallax even after that. As I just said, parallax is one of the issues you should be prepared to face when you decide to get a pen display, including Wacom Cintiq. You can see parallax in action in the following video, which shows you parallax in Wacom Cintiq 27QHD. Note:- In case you really don’t want to deal with parallax at all, certain digitizers, like the N-Trig, which is used in Microsoft Surface Pro, don’t have much parallax. Besides that, the iPad Pro doesn’t suffer from it. But both of these devices feel different to draw. In the case of iPad Pro, you will be limited to drawing with iOS apps. I have wrote a post on how drawing with the iPad in case you’re curious about it. It’s very advisable to set resolution scaling to 100% to avoid having very large offset, which can make XP-PEN Artist22E very unusable. Click here to for instructions on how to set scaling in Windows 10. XP-PEN Artist22E has 2 sets of hot keys on both sides, both side has 8 keys on them. The idea is to make it suitable for both left-handed & right-handed people. If you’re a left-handed person, you will appreciate this the most. You can customize each of these keys to do all sorts of keyboard shortcuts for you. Some artists opt to use the keyboard instead of hot keys, since they need more shortcuts than what any drawing device offers, the choice is up to you here. While there are 16 hot keys in total, but you can only use one set of the keys, as you will hold the pen with your other hand. Unless you have some innovate way to hold the pen & press the keys with the same hand. There’s an option in the driver to disable all the hot keys if you don’t want to use them at all, or if don’t want them to get in the way. Some XP-PEN Artist22E units may have hot keys problems, where the hot keys or some of them won’t work at all. It’s better to contact XP-Pen’s customer support if you got a unit like that. XP-PEN Artist22E has a good built-in stand at the back of it. 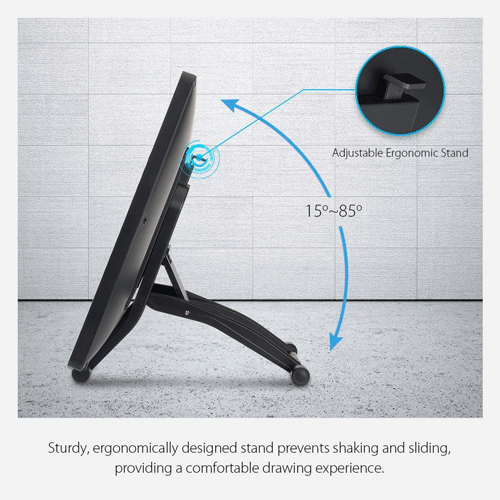 The stand is really well-made, and it allows you to tilt it between 15° to 85°. Giving how the cables are located on the side of XP-PEN Artist22E, they won’t get squashed and hinder you when you tilt tilting XP-PEN Artist22E to the max. This is an issue XP-Pen Artist22 had too. It looks like XP-Pen learned from their lesson & improved their product. While the stand is good, and does what it intends to do, some artists may want to swivel & rotate the screen in addition to tilting it. For that case, you can remove the stand to reveal a 75 X 75 VESA mount, where you could mount XP-PEN Artist22E to an arm, which gives you a lot of possibilities of moving it while you draw. XP-PEN Artist22E comes with 2 pens. Each of the pens has two buttons at the side of it, something all the pens in graphics tablets & pen displays tend to have. Just like the case with hot keys, you can customize the pen buttons to do some more shortcuts, the ones you may need the most, like switching to the eraser key (There’s no eraser on the other side of the pen). You can disable the buttons from the drivers in case they got in the way. The pens charges via the included button, which you plug at the back of it. You don’t have to worry about charging any of the pens too much, since they last for a long time once they are fully charged. Since there are 2 pens, you can charge one of them while you use the other, though you are unlikely going to need them for that. For the most part, having 2 pens is useful for in case one of them breaks, or in case you lost one of them. Speaking of that, one of the good things I like about XP-Pen’s pens is that they are very cheap to replace in case you had to buy a new pen in the future. Besides the 2 pens, XP-PEN Artist22E also comes with a pen holder, which is intended for you to place the pen when it’s not in use. 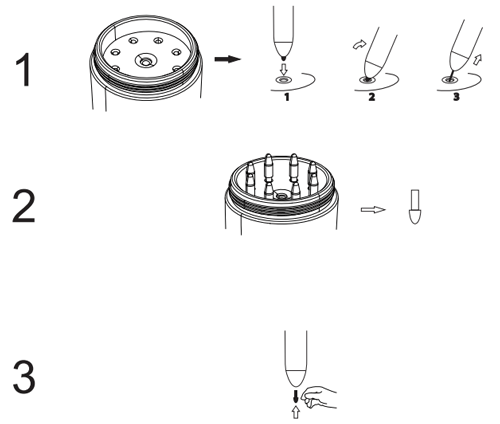 Inside the pen holder, you can find 8 replacement nibs. You need these nibs to replace the nib of your pen when it wears down. The nibs tend to last depending on the smoothness of the screen surface and the amount you press the pen on the screen. I have written a post about how much nibs last in case you’re curious about this. The post is about Wacom, but the things mentioned in the post apply to other devices. The pen holder doubles us nibs remover, where you can remove the pen nib by inserting it into the hole in the pen holder. XP-PEN Artist22E comes with a black drawing glove. The glove covers the lower two fingers, which is the part of your hand you place on the screen while you draw. It makes it easier to draw without smudging the screen, and to move your hand around the screen more smoothly (sometimes your hand rubs on the screen). One of the tips I often advise you when you get to install XP-PEN Artist22E’s driver is to remove any Wacom driver installed on your computer. This is just in case to avoid any conflict, as that can make sure that your XP-PEN Artist22E is actually working. Once you made sure the driver works well, you can try installing the driver side by side with Wacom driver (bear in mind you may have issues there, assuming XP-PEN Artist22E’s driver allowed you to do that). 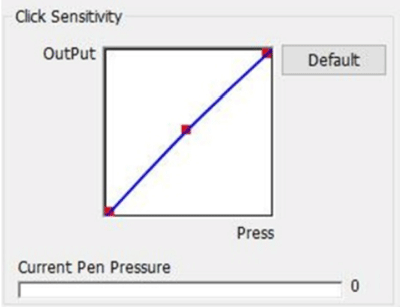 There’s an area in the driver where you can test pressure sensitivity to see it if actually works. You may have considered buying XP-Pen Artist22 before, or owned it before. You may be wonder what are the differences between the two. The first difference is the placement of the ports, they are placed sideway rather than at the bottom. The 2nd difference is the inclusion of hot keys on the top of XP-PEN Artist22E itself, and there are 16 of them on the top of that. Other aspects, like the screen resolutions, size, pressure sensitivity, supported display ports are all the same. 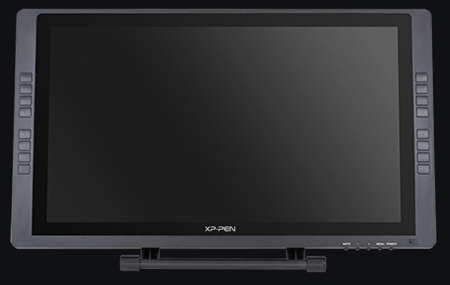 XP-Pen Artist22 is still a viable solution if you could find it with a good price, but for the most part, you should go for XP-PEN Artist22E. XP-PEN Artist22E is quite an improvements over XP-Pen Artist22, they improved it quite a bit over that model. Overall, the screen size is good for drawing, the same goes for the 1080P resolution. The stand is good for when you place XP-PEN Artist22E on your desk, as it allows you to tilt it to suit the way you sit down. You also have the option to mount it to an arm if you want more flexibility. Either way. you will need to recalibrate the pen every time you change your sitting position or tilt it way too much. Besides the possible parallax & the screen protector you may find annoying, there’s not much to complain about it. You can judge almost everything else about XP-PEN Artist22E from what you read in this XP-PEN Artist22E review. If there’s anything else I may have missed about it, tell me about it in comments, and I will try to expand this review and add it there. Ugee UG-2150 review – One of the best Cintiq Alternative out there (has no hot keys).